A little while ago I decided that I needed to shake things up a bit in the weights department. I was bored and in a rut with no great improvements in strength or confidence. Training by myself was demotivating and I was yearning for more. I consider myself a pretty driven person but my training was definitely lacking. I thought about the next step for some time until I realised that if someone came to me as a health coach and told me this story I would suggest a personal trainer to help motivate and keep them accountable. I eventually found myself a wonderful trainer Courtney who said she knew just the thing to make me work HARD! At first I was really scared to try a new form of weights that I had never done before. 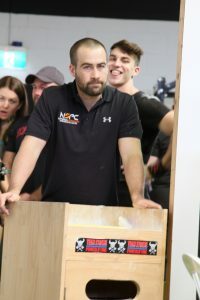 When I started at a new gym with big heavy looking weights and power lifting equipment…..I thought to myself “what have you done.” The gym that I train at is free from non-functional machines and is a facility offering the highest International Powerlifting Federation competition approved equipment. Stuff that I didn’t have a clue about. 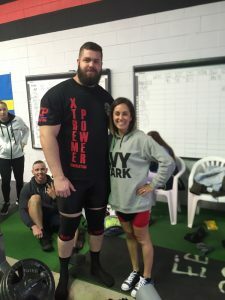 My first training session I was assessed and began my training in learning how to “squat like a powerlifter” and do things like a dead lift… which I was certain would break my back and of course the bench press (my weakness). There was so much to remember and I’m sure that this type of training is also great for your brain. With cues like: eyes up, arch hard, squeeze glutes and push….push….push. Fast forward to about 9 months of 1 a week sessions with Courtney I began falling in love with the challenge of PT sessions and so much technique work. The whole way through my training I had the gym owner and Powerlifting Strength and Conditioning Coach in my ear about competing. I really thought this guy is insane….look at me I can’t “lift”. To get the picture I am a petite 5ft 2inch woman who generally feels more comfortable doing cardio based training. But in the back of my head I thought “maybe one day”. 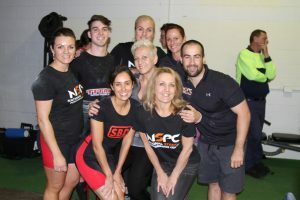 Simon has himself competed for Australia at the Asia/Oceania Powerlifting Championship in Uzbekistan. After many ear bashings by what I now think of as my early morning Powerlifting family I thought you know what I’m going to give this thing a go. What did I have to lose? Nothing! 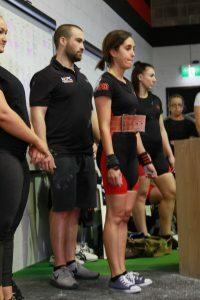 I signed up with Powerlifting Australia and became a member and before I could think twice I hit submit on the computer to enrol in my first competition. No turning back! I trained for 4 weeks at 4 sessions a week. There were so many times I doubted myself but the dedicated team at NSPC always had my back. I have had days were I feel like my thighs might snap and the thought of going to the toilet is scarier than the exorcist. I have used many choice words sometimes thinking that my coach must have made a mistake…..I can’t do 50 chin ups……I can’t do a double body weight dead lift……I can’t bench press more than the bar. I even had to reduce my weight from a solid 47-48kg to under 47kg for comp day. I may have even dreamed of eating some Pana chocolate. 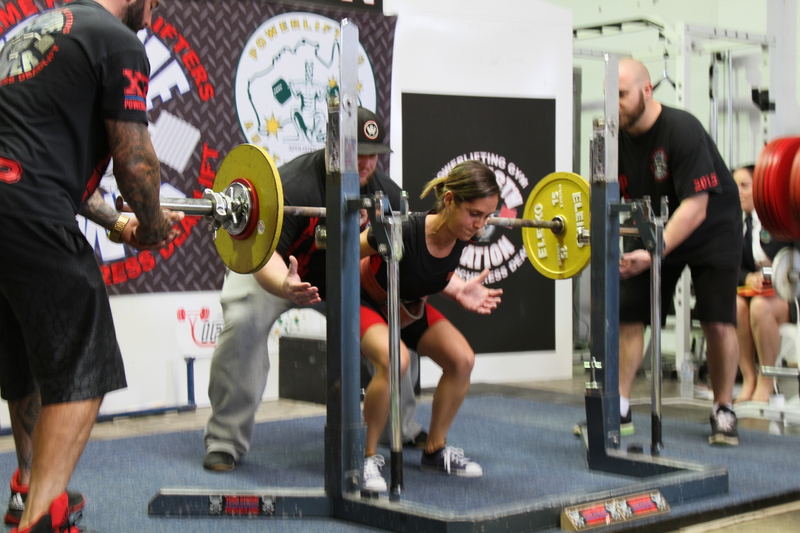 On Saturday the 18th June with my coach slapping me on the back I hit the podium for my first lift. Look how nervous I am. Squat: 62.5kg definitely working on this! Bench Press: 37.5kg missed @ 40kg…… next time I got it! Deadlift: PB 102.5kg more than double body weight! A proud moment for me. Big thank you to my coach Simon for distracting me until the last second so I had no idea what I was about to lift. It worked! The moral of my story is: Stop doubting yourself…..You are not too big…..too small….to unfit! You just have to take the first step and trust in the process. If you are embarking on a journey like me make sure you have an expert to ensure your program is safe and tailored to your specific needs. I never promote trainers that I don’t truly believe in but Simon and the team can hook you up no matter where you are living. Check out the website and if they can get teeny tiny me to “lift” there is no doubt you will be smashing your goals too.